We're here again with another MFT Color Challenge! Join us as we create with this trendy color combination. Armed with her trusty Peerless Watercolors, Barbara creates a dreamy thank you card incorporating the Twice the Thanks and Flutter of Butterflies - Lace and Solid Die-namics. The two-toned butterfly looks particularly lovely with the Coral Crush and Persimmon color combination. Inge knows that the striped paper from the Dots & Stripes Sorbet paper pack is a color match for Coral Crush and Persimmon because of our handy Color Chart located HERE. It makes for the perfect backdrop for this whimsical design featuring the sweet elephant from the Adorable Elephants stamp set and Die-namics. Coral Crush and Persimmon when paired together make for a bold frame for Julie's design. 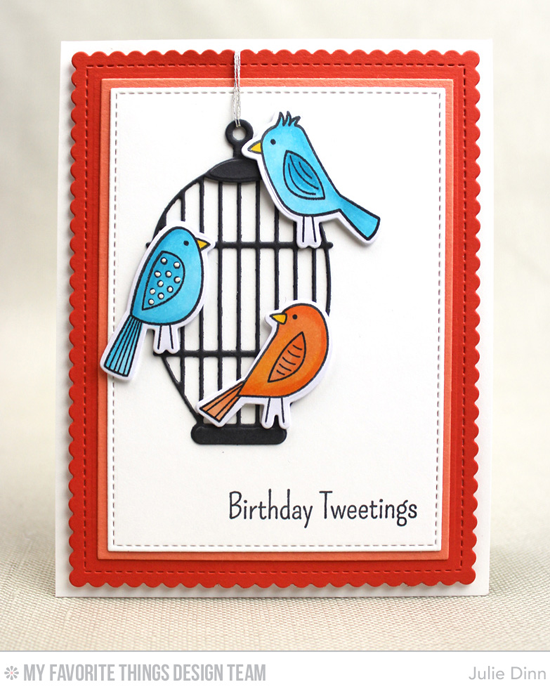 A Steel Grey cage makes for a pretty perch for three birdies from the Tweet Friends stamp set and Die-namics. The addition of a great deal of white makes the colors sing. Melania goes bold with the shades of orange in this color combination using Persimmon as the card base and Coral Crush with the lovely scalloped rectangle from the Blueprints 27 Die-namics. And look at the clever thing she did! She removed the horn and baton from the hands of the bunnies from the Strike up the Band stamp set and added in pencils from the Get Down to Business stamp set for a fun change of pace. Congratulations, Janet Perafan-Babar! You are the randomly selected winner of the MFT Color Challenge. You can view all the entries from the last challenge HERE. You have until Wednesday, April 13th, at noon EDT to add your link and be eligible for the prize of up to $20 in MFT Cash. Winners are chosen at random, so everyone has a chance! The prize is a $15 Gift Voucher to My Favorite Things, but if you use MFT stamps and/or dies in your project, you’ll receive an extra $5. Another great color set, these cards are bursting with happiness! And so am! Thank you so much! Astonishing color combo! These projects are fantastic as well. It would be great to play with these challenge. Cheers!